To attract attention for this credo, our founder Klaas Weima published a book about it. 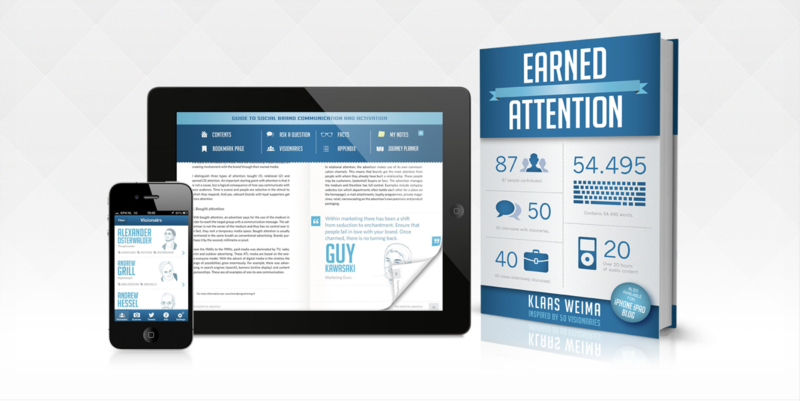 It contains interviews with his favourite thought leaders in marketing, advertising and pop-culture who are all debating the subject of Earned Attention® in a message overloaded time. Cultivating the many communication channels this time has to offer, the book is complimented by a blog, a mobile app and a tablet app. This allows anyone to join the debate, listen to actual interviews, find more information on given subjects and tweet directly with the author about it. Earned Attention® has earned the attention of teachers and students throughout The Netherlands, as it has now become part of the curriculum at Hogeschool Amsterdam, Rotterdam and Utrecht. The project was also nominated for the PIM Literature Award and shot to the number 5 position of the Management Book Bestseller list. The iPad and iPhone app jumped to number 2 in the Appstore‘s books section within a day and if you Google ‘Verdiende Aandacht’ (Dutch for Earned Attention®) you will find that the project earned quite some blog attention as well.